Steve, Terri, and a joey. Steve and Terri had a close relationship which was love at first sight. 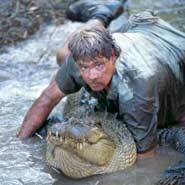 Steve Irwin doing what he does help, wrestling crocs! Steve is my hero. I look up to him and he will be missed. But he is looking down us. Saying get fighting for these wildlife, because that was his dream. I do anything for wildlife. That why I want to work with wildlife becauseit something we all sure. This for Steve. Steve you where awesome. My seven year old son and I watched your show all of the time. He is determined that he will be a croc hunter one day. You are still his hero. there will never be another like steve, he was the best!!!!! steve you were the best person. And now the animals and his friends have lost a good friend of them. I hope his family is ok now and his kids can do what he did best. Steve, you taught us all how to be better stewards of the planet. If every one could have a little �CRICKY� in us the world would be a better place! Steve, this is what we all loved about you!